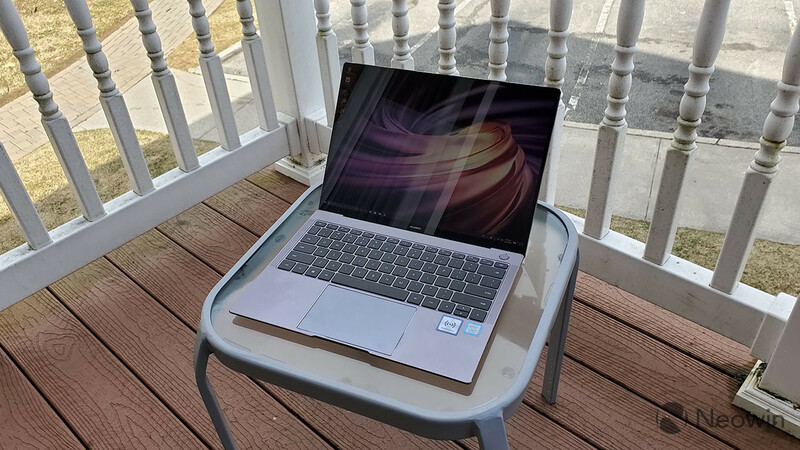 Last year, Huawei's MateBook X Pro was one of the best laptops around, putting an eighth-gen Intel Core processor, dedicated graphics, and more into a thin and light body with a beautiful display. That hasn't changed in the 2019 model, which was announced at MWC this year in Barcelona. In fact, the body hasn't really changed at all. The specs have been bumped up, as it now has Whiskey Lake CPUs and an Nvidia GeForce MX250 GPU. There are also some fun new features, such as OneHop, which lets you easily share files from your phone to your PC, and vice versa. There's also a three-finger screenshot feature. Ultimately, it seems that MateBook X Pro has added some cool stuff, all while not trying to fix anything that wasn't broken. The things that actually were broken are still here though, such as the awkwardly placed webcam. There are a few things to be aware of with the specs. 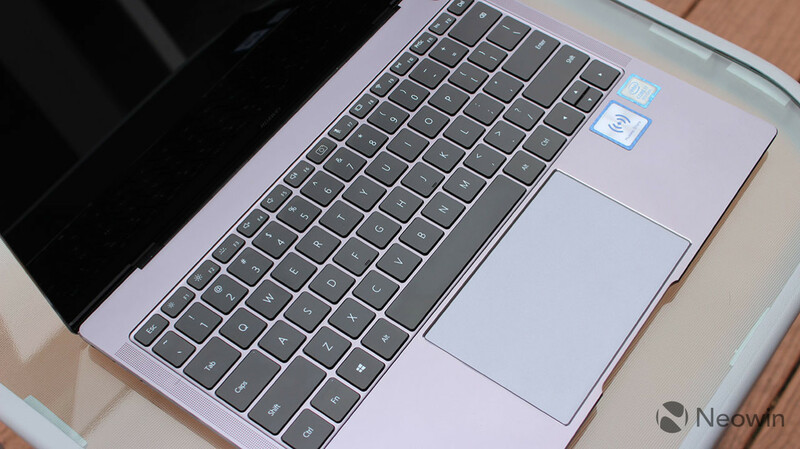 You can also get it configured with a Core i5-8265U CPU, 8GB RAM, and either 256GB or 512GB storage. The problem is that it's not out in the U.S. yet, so I don't know what the specific configurations will be or what the pricing will be. The specs above are for the model that Huawei sent to me. As I mentioned earlier, the body is the same as it was last year. In fact, not only does it have the same dimensions, but Huawei's spec sheet lists the exact same weight of 1.33kg (2.93 pounds), which is surprising since different internals should have at least a slight change. Either way, it's a thin and light device that comes in at under three pounds. The color is Space Gray, although it should also come in Mystic Silver or something like that. 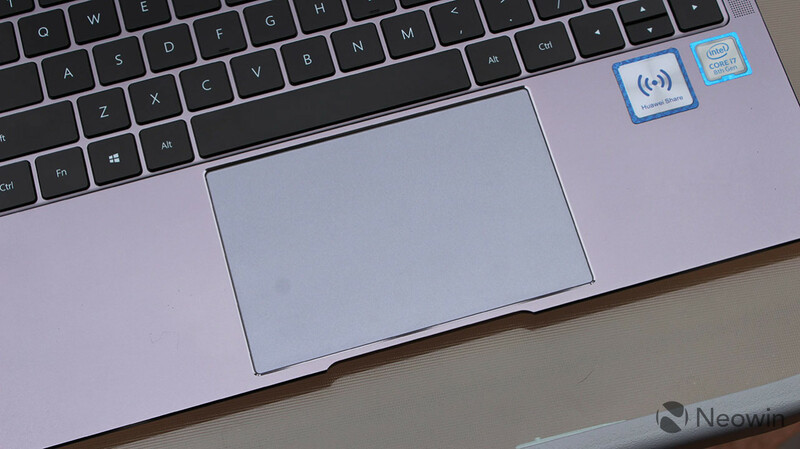 It's got the aluminum unibody design that we've seen from many companies by now, so don't expect to be able to take it apart and repair it. On the right side of the device, there's a single USB 3.0 Type-A port, and that was one of the key upgrades from the original MateBook X, which was thinner but did not have USB Type-A. 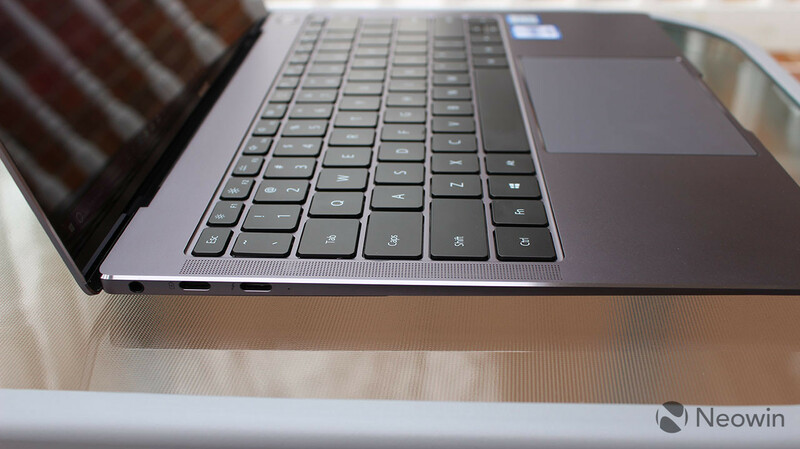 On the left side of the device, you'll find two USB Type-C ports, and behind them, a 3.5mm combo audio jack. Like last year's model, one of the Type-C ports is USB 3.1 Gen 1 and the other is Thunderbolt 3. What's new though is that the Thunderbolt 3 port is a full Thunderbolt 3 port, with 40Gbps data transfer speeds and the ability to connect to two 4K monitors. You'll find the chiclet-style keyboard on the device as usual, and the power button above it has a fingerprint sensor in it. The cool thing about that is that it scans your fingerprint when you boot up the device, rather than having to do it again after it boots up. This is one of the most convenient methods of biometric authentication that there is, and if you ask me, it's the only thing that's more natural than facial recognition. All of the other bells and whistles are here. There's a large trackpad, narrow bezels around the 3:2 display, and so on. As I've said, the new MateBook X Pro is externally the same as last year's model, so it has the same 13.9-inch 3000x2000 touchscreen display. The bezels on the sides and top are 4.4mm, giving it a 91% screen-to-body ratio. It also has a very small chin, which is why there's a better screen-to-body ratio than other PCs with narrow bezels. Whether you like this or not is a matter of preference. I do like the bottom bezel to be a bit larger, as it props up the display a bit. This display is fantastic though. For one thing, it's bright, at 450 nits. You can easily work outside in bright sunlight with this machine. It also has a 178-degree viewing angle, so the image won't be distorted when viewing it from the side. Being that it has a 3000x2000 resolution, it obviously has a 3:2 aspect ratio. Again, this comes down to personal preference, but I like a more traditional 16:9 screen, as it just feels more natural when using two apps side-by-side. 3:2 is the same aspect ratio that Microsoft uses in its Surface products, so it's obviously popular. 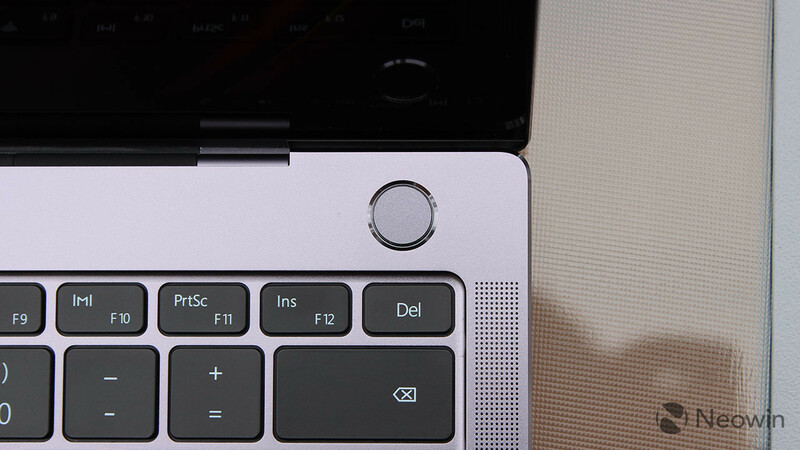 The chiclet-style keyboard on the MateBook X Pro has 1.22mm keys, so it's a bit on the shallow side. Standard clamshell laptops tend to have between 1.35mm and 1.5mm. The difference is noticeable, but it's still comfortable to type on. Remember, this is a very thin and light PC, which doesn't make other sacrifices. 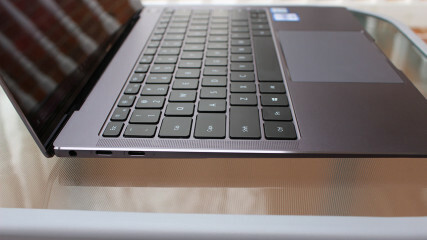 It has touch, a clickable trackpad, and a dedicated GPU. I'm OK with the keys being a bit shallower than they would be on another PC. 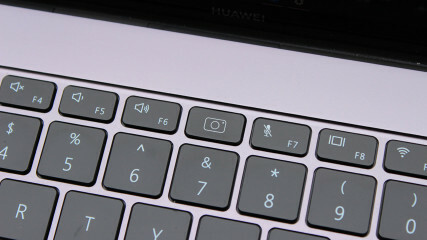 Once again, Huawei put the camera between the F6 and F7 keys, in the keyboard. Press the button and the camera pops up. This feature is awful, and it's somewhat reminiscent of Dell putting the webcam below the display. It seems like it exists just because it has to, for the rare event that you'll ever have to use it. The camera angle is not flattering. And to be fair, you'll probably never notice it. The reason that so many OEMs are giving us these awkward camera placements is that no one uses their webcam anymore. Consumers use their smartphones for video chat now. If you're buying a business PC, you probably need better webcam placement though. The only thing is that, if you really do need to use the webcam, you'll probably want something that works better than this. 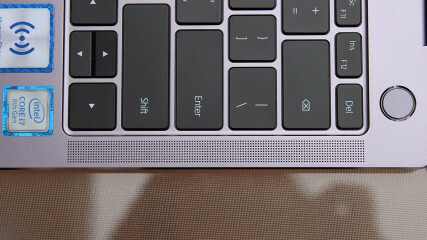 Below the keyboard is a massive trackpad. Seriously, this thing is huge and it's amazing. To me, nothing beats a big, clickable trackpad like this one. It uses Precision drivers, so it supports all of the gestures that you're used to. 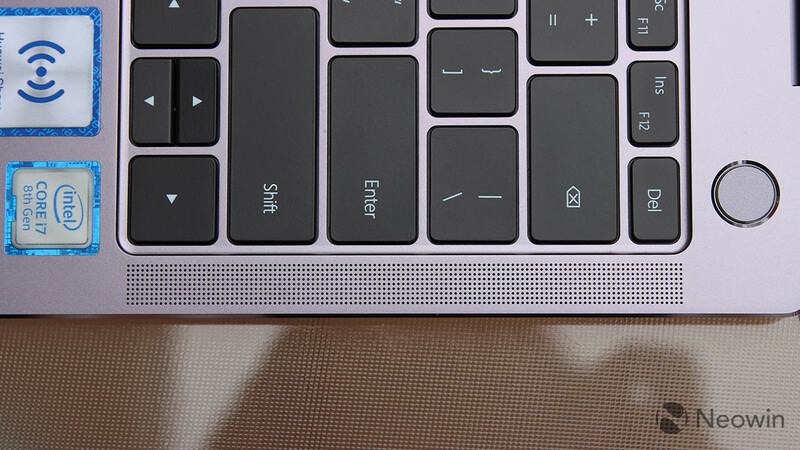 Finally, to the left and right of the keyboard you'll find the speaker grilles. 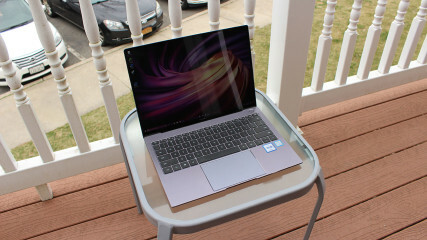 The speakers support Dolby Atmos, a feature first introduced by Huawei with the first MateBook X. I don't always talk about audio quality, but I do with Huawei's laptops that support Dolby Atmos, because they sound awesome. 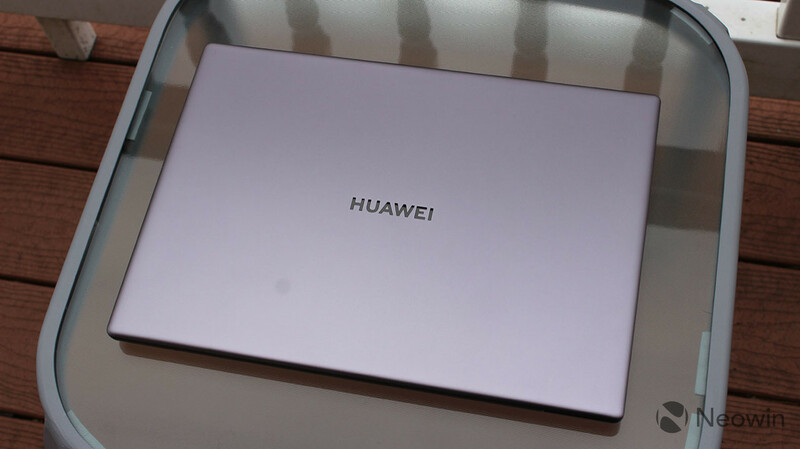 It's a great machine for watching movies, especially with the beautiful display, but that's why it also bums me out that Huawei keeps expanding its lineup of clamshell laptops without introducing a convertible. Now that we've covered the general usage of the MateBook X Pro, let's talk about new features. Personally, I think that OneHop is one of the greatest features added to a laptop. All you have to do is tap your Huawei phone on the Huawei Share button, and you can easily share photos, videos, and more. There's one obvious catch. If you're in the United States, you probably don't have a Huawei phone, so this feature will be useless to you. I'd also recommend buying one of the company's phones unlocked because I believe them to be best-in-class (check out the P30 Pro review coming soon), but that might not be an option for some. In general, Huawei Share is an awesome feature. It works like Apple's AirDrop, except for Huawei devices. I really wish that this was more common in the Android and Windows worlds. But OneHop is pretty much using NFC to conect via Huawei Share. It's cutting out the share menu dialog, so you can just select a bunch of images and files and tap your phone against the PC. There are a couple things about OneHop that are a little awkward at first, but are easily worked out. When you transfer files from your phone to your PC, they open up in an image viewer that's seemingly impossible to open otherwise. From there, you can choose to save the files to your PC. If you transfer over 100 photos, it could be a bit tedious to save them each one at a time. Everything sent over is actually stored in the C:\HwShare folder. If you want to put them all in your own folder, as you probably do, just do it from the File Manager. There's also a three-finger screenshot feature. I'm not nearly as excited about this as I am about OneHop. Since the display supports touch, you can just swipe down with three fingers to take a screenshot. Once you do that, you can draw on the screen to select a portion of it. For example, you can draw a circle to get a circular portion, or you can draw a diagonal line for a rectangular section. Unlike OneHop, I didn't find this particularly useful. The truth is that taking a screenshot in Windows 10 is easy. You can press Win+PrtScn to take a full screenshot and automatically save it. Microsoft also has its new Snip & Sketch app, or even the older Snipping Tool for taking a screenshot of a portion of the screen. 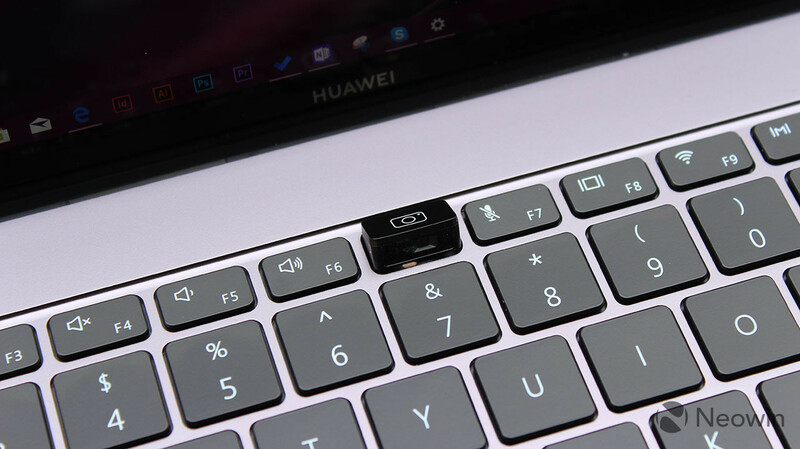 When I asked Huawei why this feature was necessary, I was told that many Windows users don't know how to take screenshots. 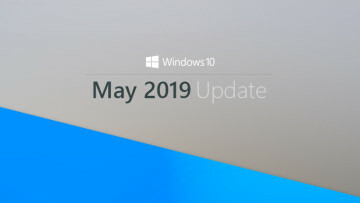 It seems to be that the effort that it will take to educate users on three-finger screenshot could have simply been used to educate users on how to take a screenshot with the tools that Windows already offers. Some of my colleagues often make fun of me because I tend to carry a lot of laptops when I travel. There's usually a convertible PC for writing and taking handwritten notes, a backup in case that machine fails me, and something with a dedicated GPU and maybe an H-series processor for editing a video. 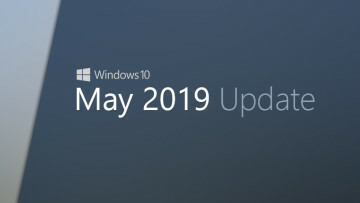 Sometimes, I'll bring even more to test Windows Insider Preview builds. When I went to Paris for Huawei's P30 launch, I only brought the MateBook X Pro (as my only PC, not my only device). After all, it is a pain to carry around so much stuff, and to go through airport security with so many devices. And truthfully, this machine has everything that I need, with an Intel Core i7-8565U, 16GB RAM, a 1TB SSD, and an Nvidia GeForce MX250 GPU. 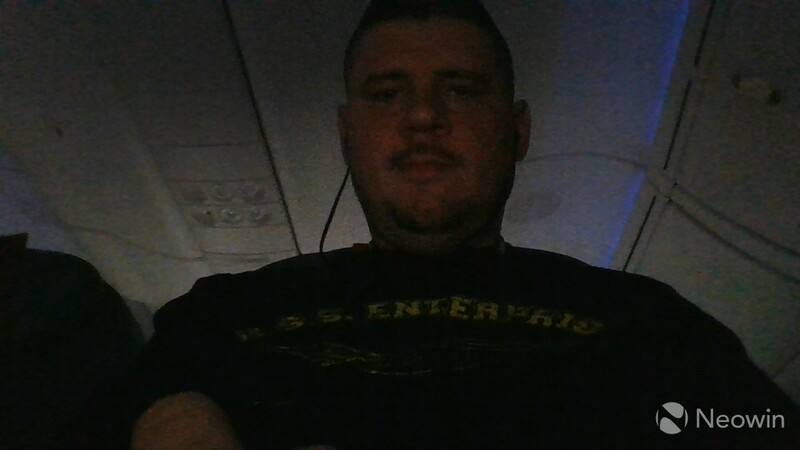 OneHop was also a great feature for traveling. It means I can carry fewer cables, as I don't have to transfer files over a wire. Also, particularly when I use an iPhone, I'll end up uploading to OneDrive and syncing with a PC, a terrible experience on hotel Wi-Fi. The point is that it did indeed have everything that I needed. I recorded an unboxing video with the Huawei Mate 20 Pro, transferred it to the MateBook X Pro with OneHop, and edited it in Adobe Premiere Pro, which worked quite well with the 2GB dedicated GPU. The one thing that I really missed was a convertible form factor, as I do often take handwritten notes and I also watch movies. 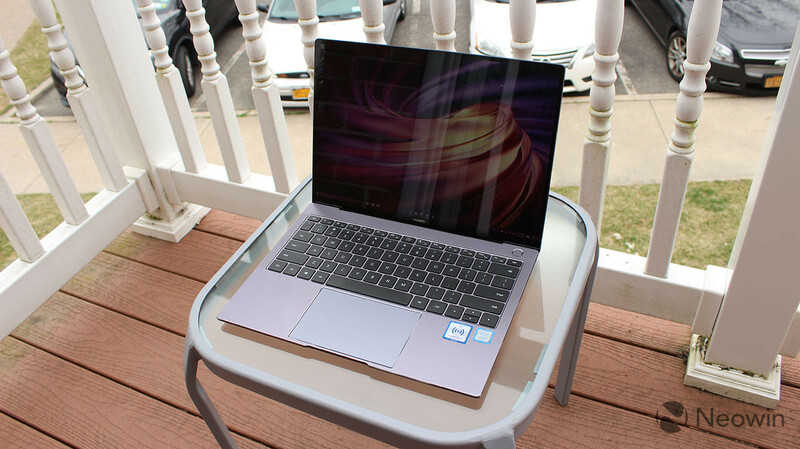 The MateBook X Pro is a great productivity machine that can do more. It's great for those common productivity tasks, but it can handle Premiere Pro and Photoshop when you need it to. For benchmarks, I used PCMark 8 and PCMark 10. PCMark 8 provides three tests: Home, Creative, and Work. The Home test focuses on common tasks like video chat, web browsing, casual gaming, and more. You can see that the MateBook X Pro does well, but not as well as more powerful machines that are built for gaming. Next up is the Creative test, which focuses on GPU-intensive tasks like video editing and mainstream gaming. The scores in the Creative test really aren't any better than a PC using integrated graphics. I wouldn't put much stock in this though, as the real-world performance is actually pretty good. Finally, the Work test focuses on productivity-related tasks like writing and spreadsheets. For the Work test, while it performs well, it's still not as good as a laptop with integrated graphics and a U-series processor. 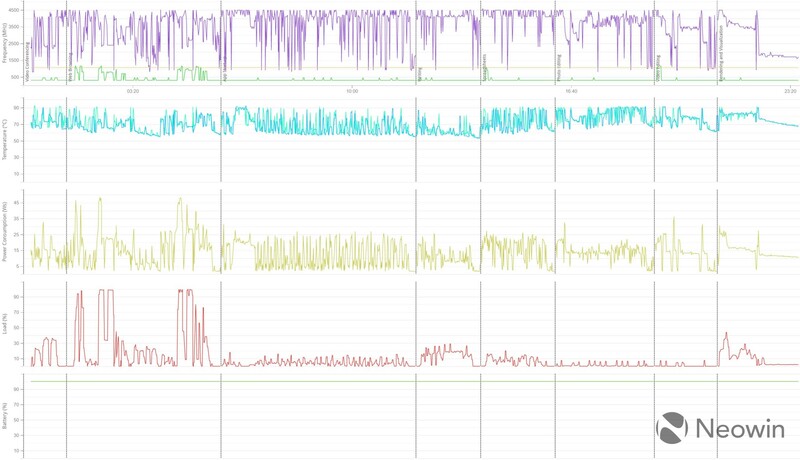 This is actually a common result for a PC with a dedicated GPU. Next, we have PCMark 10, which I used to run an all-in-one test. 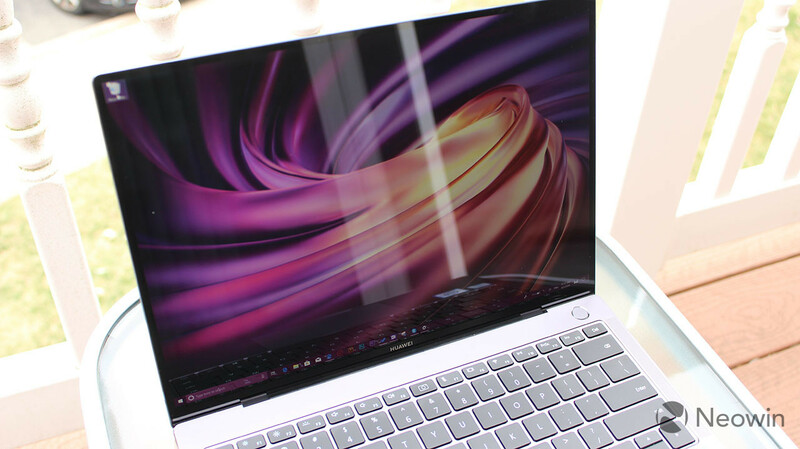 Huawei's MateBook X Pro is a wonderful laptop, just as it was last year. I can say that because there are minimal changes. 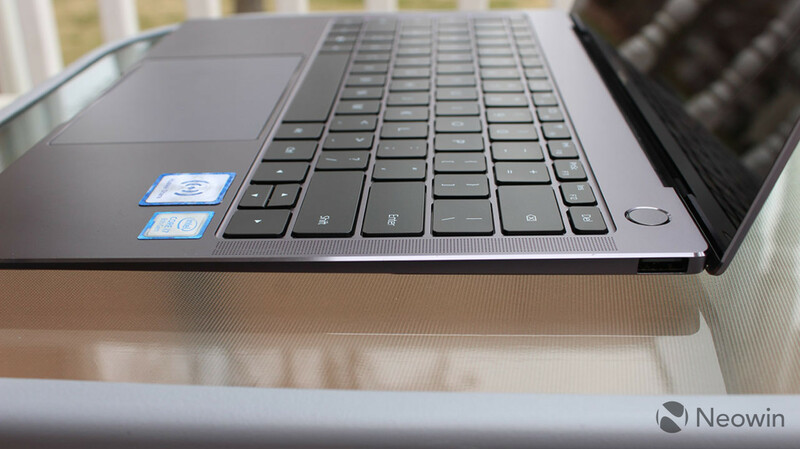 Last year's model had eighth-generation Intel Core processors from the Kaby Lake family, and this year's has eighth-generation Intel Core processors from the Whiskey Lake family. Last year's had an Nvidia GeForce MX150 with 2GB GDDDR5, and this year's has a GeForce MX250 with 2GB GDDR5. While the hardware is an incremental change, the addition of OneHop is awesome. 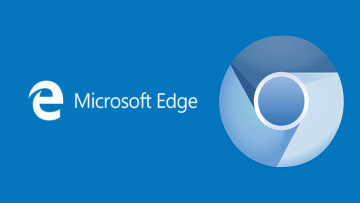 It makes sharing files to and from your PC an incredibly seamless experience. Three-finger screenshot still seems pointless to me, but if that's what you're into, it's there. Ultimately though, this is just a pleasant device to use for all tasks. 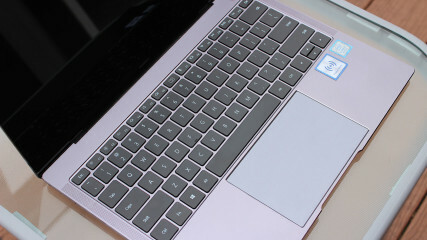 It has powerful internals, a bright and vivid display, a huge trackpad, and a solid keyboard. Sadly, I just don't know how much it will cost or what configurations will be available. All of that information should be available next month. If it's anything like last year's model though, you'll be able to get a Core i7, 16GB RAM, 512GB storage, and the dedicated GPU for $1,499, and that's a great deal.